Aluminium frame camping cots used to be only available to altitude campers and other explorers willing to pay extra for the best camping cots. Fortunately, aluminium is now a readily available resource for many manufacturers and as such is making its insurgence in the camping cot market. Teton’s Sports Outfitter camping cot is one of the most ideal camping cots that you’ll ever come across. It is mainly aimed at serious campers but it is well within the price range of the middle class outdoorsman. This camping cot features some interesting structural advantages which help to make it stand out from the rest of the market. When thinking of quality, this Teton Sports Outfitter camping cot is a very good value for money option. 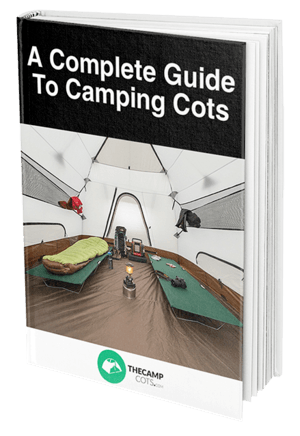 The cot combines all of the standard aspects you need out of a camping cot, but also ads a few other small design tweaks to ensure it can appeal to a wide range of users. Gone are the days of discomfort when you spend a night out in the wild. There are certainly a wide range of comfortable high quality camping cots on the market today. Whether these cots are durable though can be a question with many. Some cots may have extremely comfortable mattresses, but lack the strong frame needed to support them for long periods of time. The Teton gets it right in terms of strength, and a comfortable mattress topper could easily be added to the top of this camping cot to increase its luxury appeal. The minimalist design of the cot itself is beneficial in that it gives its owners options as to how they want to use it. When fully folded out, the Teton takes up a decent amount of space, allowing enough room for a full grown adult to comfortably stretch out on it for the night. Apart from its aluminium frame and decent sizing, there are some other factors worth mentioning as well. These include its patented steel “S” legs and specialized carry bag. The “S” legs is a unique patent design that gives the cot a strong enough structure to support it’s 600 pound weight limit. For heavier campers, it is a comfort to know that the cot will never give out beneath you. The Teton camping cot’s optional add-ons are worth giving some attention to. The Outfitter Camp Pad, Outfitter Quick Tent, Gun Sleeve, Under Cot Storage and Cot organizer products have all been specially designed to complement the use of the Teton camping cot. We like that the Outfitter range does include a tent because the size of the Teton camping cot means it may be too large to fit in most conventional one person tents. Aside from being a good fit size wise, the Teton tent is also made in the same high grade quality of durability as the stretcher, meaning they’d make a great matching set to go camping with. We think the Teton and a couple of its add-ons would make the perfect ‘big’ gift for an outdoorsman (or woman) at a Birthday or Christmas party. We have no doubts that both buyers of and gift recipients of the Teton camping cot will be very impressed by its functionality and durability. There’s a lot to like about the Teton Camping Cot. You truly can count on getting a good night’s sleep every night if you choose to buy this cot. The sleeping area is massive – about the size of a twin mattress, but raised off the ground for protection from the cold. The whole cot also folds up and down easily which is very convenient for those who are intending to move camp often (e.g. hikers). The 42” x 12” x 7” packed up size could probably be transported in a grown adult’s camping backpack without too much hassle. The Teton brand definitely seem impressed with their own handiwork I this cot, and are well to stand behind it. The cot actually comes with a lifetime warranty! Although there is some limitation to the warranty it is still a good indication of manufacturer confidence in the durability of this cot. To sum up what we like about the Teton Outfitters Camping Cot is quite simple, this cot does everything important right, and doesn’t add anything unimportant. That’s a huge endorsement to any practical buyer. Apart from a few gripes about the stiffness of the bed/fabric for those with sensitive backs, there’s really not much to report on the negative side for the Teton. The stiffness has been an issue for some users though, and as such we highly recommend that you do get a mattress (like the super compatible Teton Outfitters Camping Pad) to pair with this camping cot. If we really had to pick it apart then we could probably also complain about the lack of color range for this cot. Not everyone in a fan of black Teton. Provide more options please! Amazon is well known for having the lowest price for camping products, so that’s probably going to be your best place to buy the Teton Outfitter Camping Cot. As with any purchase on the platform, you may be eligible for free shipping as the product is in the ‘high value’ category, coming in at around the $110 mark. We can stand up and say that the Teton Camping Outfitter is close to being the perfect camping cot. Yes, there are others to consider that might come with a built in mattress, but if you’re looking at just the “camping cot” part of the item, then the Teton is perfect. We’re stoked with this cot and can only applaud Teton for putting such a great option out on the market. We hope you’ll get to enjoy it!